Living in an RV full time with kids was one of the biggest risks we have taken as a family. On January 5, 2011 we left behind the life we knew – Jon’s job at the bank, the 2600 square foot house we designed and built on our land, our families, and our community. It was not a dream for us, it was a jump off of a cliff to have the family life we craved. We needed to regroup from the craziness of working overtime, volunteering, public school, and kid’s activities. So, we packed up our four kids along with our animals (dog, cat, and fish) and moved into the first RV we set eyes on. It was pure craziness. The first night we stayed in our RV was our first night on the road. It was a moment in our life about survival. And what we have found on the other side is a life of thriving and connecting. What is it like to live in an RV? Here are some answers to some frequently asked questions. Thanks for joining us on our life journey! Our interview”48 States in 4 Years” with Families Living the Adventure by Family Adventure Podcast. 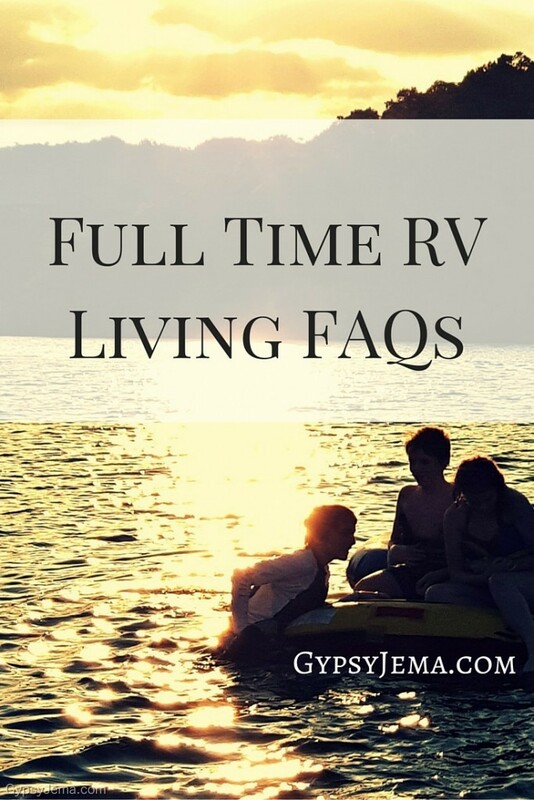 Amazing RV Living Resource Website and Video Archives at RVLove. I know how overwhelming it can be when you are first gathering information or beginning your journey. If you have more questions or want to meet, email me at jema@artbyjema.com.